I’m a frugal person by nature and buying a house and soon having a baby, I am even more tight with my money. Despite me being a bit cheap, I still wanted to decorate the house and make it into a home we enjoy being in. Plus, I like when things are pretty. The “before” pictures of the room is not that awe-inspiring. It was a blank canvas ready to be painted, not an eyesore that really needed to be changed. 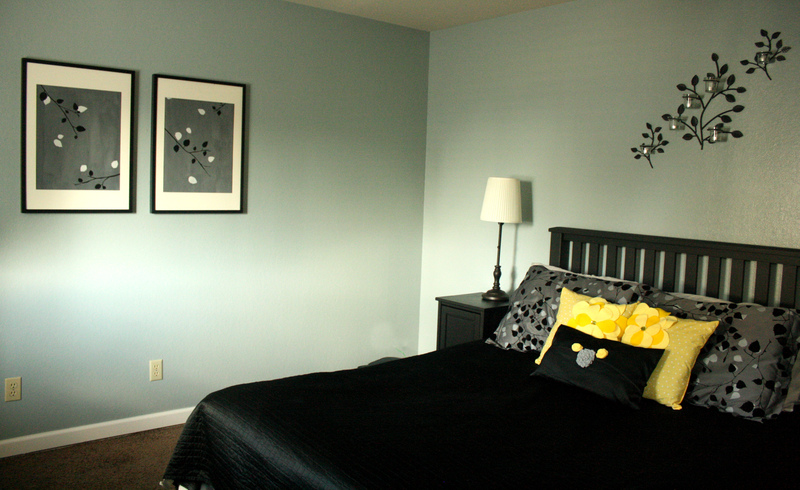 We started off by painting all the walls gray, except one wall we painted white and then striped yellow over. We just went over to our local big hardware store and grabbed some colors we thought would work well. 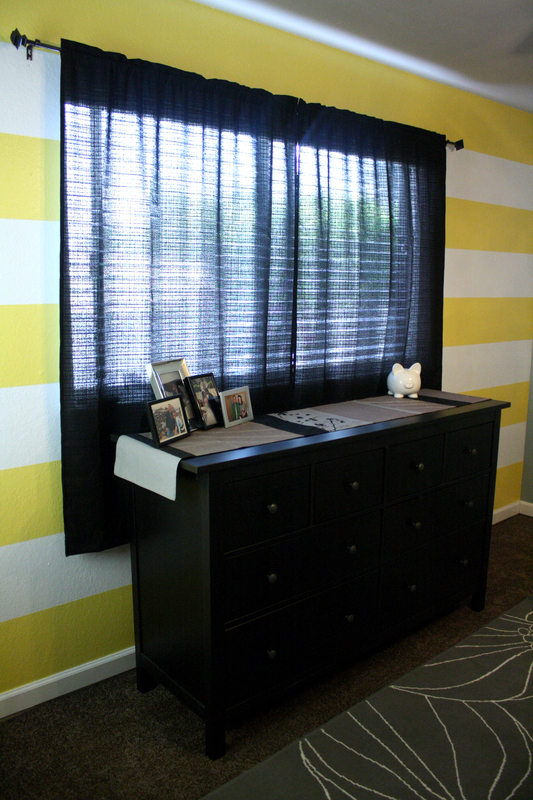 The dresser and two nightstands are from Ikea’s Hemnes line. The rug is also from Ikea (such a steal at $20 for a 6×5 rug! ), and so is the curtain rod. The curtains, I think, are from Wal-mart. We used a table runner we got at Target a few years ago as an accent on top of the dresser along with our white piggy bank and an assortment of picture frames. The two large frames are from Ikea as well. I turned the paper inside out and painted them with regular acrylic paint to match the pillows on the bed (we also have a matching comforter, but it’s a bit too warm to use this time of year). All the bedding is from Target, as well as the candle sconces over the bed. The lamps are from Ikea (and so are the nightstands, as mentioned before). I bought a headboard off of Craigslist for $15 and painted it flat black to match the rest of the furniture (I primed the headboard after sanding it and used a couple of coats of a paint sample of Behr paint). The pillows I made a couple weeks ago, which can be found HERE. It’s amazing what paint can do for a room! 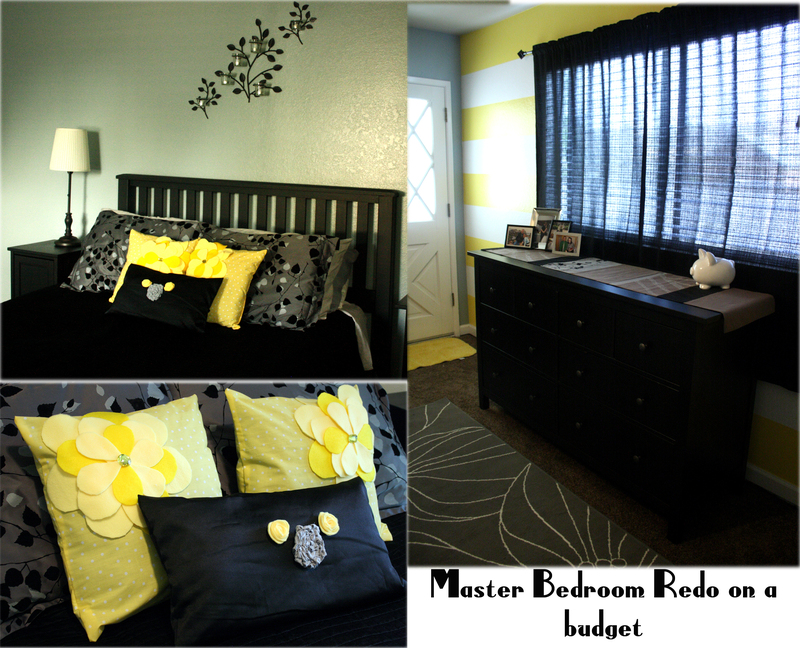 Throw in a few decorative accents and you can really pull a room together on the cheap! It came out really cute! Seems like you moved in and got things done really quickly! I can relate since I moved a few months ago. Family and friends are such incredible help! I LOVE the yellow, gray and black colors. One of my favorite color schemes these days. Congrats!